Right now, you are likely powering your home from another source of energy. Why not power your home with a source that is sustainable, while also reducing your carbon footprint, and saving money? If you have made it this far, you have probably already asked yourself that. 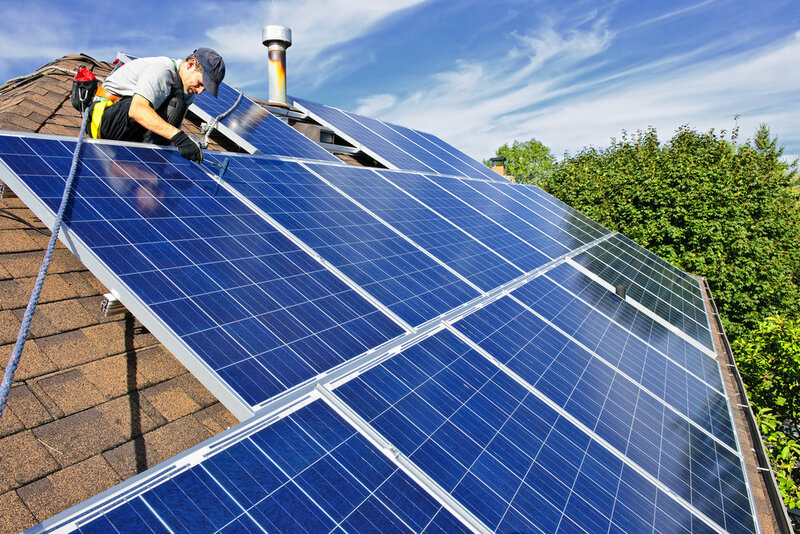 Learn more about how the process of solar power works and contact us today to get started. + How do solar panels work? Solar energy is used as an alternative source of energy as opposed to natural gas, nuclear energy, and coal. As a renewable source of energy, solar power is more environmentally friendly. So, how does it work you ask? Solar panels garner direct current energy from the sunlight through collector panels. The direct current energy is then converted into usable alternating current energy by inverter technology within the collector panels. From there, electricity flows through electrical panels to provide power for your home. It is that easy. You will not have to worry about a decrease in power on cloudy days – your solar panels will still work. Go green in more ways than one by preserving the environment and your cash. You can produce your own energy and save money while you are at it. The cost of conventional sources of electricity is constantly rising, costing your electric bill to skyrocket. With solar panels, you can save thousands of dollars on your electric bill over the next 20 – 25 years (the average lifespan of a solar energy system). You can immediately expect your electric bill to significantly decrease. With an extremely powerful solar power system, you could produce enough electricity that you will not pay electricity companies anything. In addition to savings on your electric bill, you will also increase the property value of your home. Plus, homeowners can also receive federal solar tax credits on the installation cost of their solar panel. Did you know that you could generate cash while generating energy with net metering? Based on the amount of power generated from your solar power system, you could be producing more energy than you need. Any electricity that your home does not use can be sent to the public utility power grid for use by the local electricity company. You are then compensated for the excess energy your solar panels generate. Interested in solar panels, but still concerned about the up-front costs? We offer financing and specials deals to help offset the initial investment. We are here to help you make the transition to cost-saving, renewable energy. Here's a really cool tool that would require a 3rd party plugin or some coding to make his own. So, for now, here's a free link. Phase 1: Get started by contacting us for a free consultation where you can learn more about solar panels and our process, ask questions, and schedule a visit to your home. Phase 2: An installer will assess your home to determine its eligibility for solar panels based on the current state of your roof and the amount of sun power your panels will be likely to obtain. Next, we will gain the roof measurements and get any additional information necessary such as how powerful you would like your solar system to be. Phase 3: Solar panels and an inverter are delivered, and installation begins. This process will take between one to two days to complete. Phase 4: Your solar panels are ready to soak in the energy from the sun and deliver power to your home.